I've discovered the perfect place for a business meeting, a bridal luncheon, new-home gift shopping, or just relaxing in comfort. This gem has been around for several years, but it's tucked in among shops in the back of a suburban shopping area. 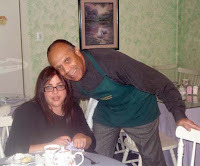 Step inside the Enchanted Herb and Tea Room and you're greeted by wonderful scents and the smiling face of Clinton Spellman. Clinton has created a combination shop and café in Owings Mills, MD, not far from the Beltway, that's close to my office but hidden and therefore private. He remembers you from one visit to the next, and always has something delicious on the menu. The atmosphere is very homey and welcoming, which made it the perfect place to meet my friend Lauren recently. Tea is the centerpiece, with way too many for me to pick from, so I let Clinton decide. He brings me a sample of one of his many Herb and Fruit Teas, Black Teas, Flavored Premium Teas, Green Teas, Chai Teas, etc., and it's always good. 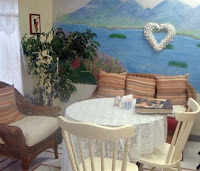 To go with the tea you have to try the scones – wonderfully warm and delicious, fresh baked to his recipe. A menu of light fare includes his onion soup that is soooo good. 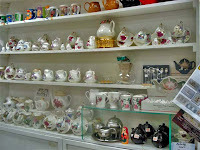 You can enjoy high tea or book a private party, and it's all served on bone china for that authentic tea room touch. For gifts, this is a great source for things you won't find in most stores. 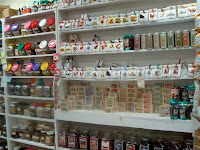 He has a wonderful selection of tea pots, cups, teas, herbs, and preserves. I took Clinton's scones and clotted cream to clients (an Irish family) and they were so delighted. So next time you're looking for a slower pace, personal attention, and a delicious lunch or afternoon tea, visit this enchanting shop. Have a scone for me. Baltimore in January - Yes, It's a Great Time to Visit! Okay, it's not Palm Beach or LA so you can't expect balmy weather. Baltimore is in the mid-Atlantic and that means we get chilly in January. But it's still a good time to visit, and I'm glad to have a chance to point out some of my favorite things about this city. Thanks to Margaret Harrington for asking! There's no season for history, and Baltimore has plenty. Oh say can you see? Of course you can at Fort McHenry National Monument and Historic Shrine. In September 1814, the star-shaped fort was the site of the Baltimore of Baltimore. On a ship some eight miles away, Francis Scott Key watched the bombardment and, when the smoke cleared, saw that the flag still waved. We still sing about it today. Fell's Point combines history and the pleasures of eating and shopping. This historic area dates to the 1700's and you'll find the oldest house in Baltimore here. The cobblestone streets add to the charm, just be sure to wear good walking shoes! There are many restaurants in the area, and the Broadway market is a sight, sound, and scent experience. It's open every day but Sunday, and right there in Fell's Point. Closer to the Inner Harbor you'll find floating history on the U.S.S. 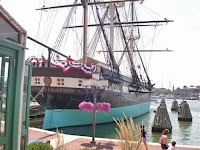 Constellation and the other ships of the Baltimore Maritime Museum. When you've had your fill of history – and are perhaps ready for some indoors time - we have plenty of arts and entertainment. The world-class Walters Art Museum has works from Egyptian to American art, and is know especially for its collection of Asian art and rare books. A bit further north, near the Johns Hopkins University campus, is the Baltimore Museum of Art. In January the museum has special exhibitions works by Matisse and Rodin. For something a bit less classic, try the American Visionary Art Museum just down Key Highway from the Inner Harbor. This unique collection showcases works by self-taught artists. If you like something out of the ordinary, this is your museum. Not far away is another quirky collection in the Baltimore Museum of Industry. This one celebrates Baltimore's history as a working-man's town with thousands of tools, machines, and pieces of Baltimore's historic firsts. After all that cultural enrichment, how about some food for the body? There are as many cuisines as there are nationalities, so you're sure to find something to suit your taste. Just be sure to try a local crab cake or crab imperial before you leave town. If you're feeling adventurous, try the steamed hard crabs experience – you'll quickly learn how to swing that mallet and extract the sweet lump of crabmeat so prized by aficionados. 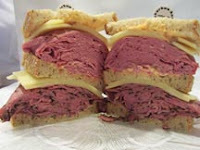 My favorite restaurants are Tio Pepe for just wonderful food and service, Sabatino's in Little Italy, Kali's Court in Fell's Point, Suburban House in Pikesville for the ultimate Jewish deli experience, G&M for great crab cakes (Margaret, this one is in Linthicum Heights!) And, of course, Lexington Market for grazing. Now that you're full of history and culture and good food, how about a bit of entertainment? Depending on when you visit, you can hear the excellent Baltimore Symphony Orchestra. (It happens that during Margaret's visit, the concert is "SciFi Spectacular" with the BSO Pops playing selections for Star Wars, ET, and Superman, with George Takei as narrator, and a laser light show!) Unfortunately, those January dates don't correspond to performances by the Baltimore Opera or Center Stage, but there are other entertainment options depending on your tastes. Which brings us to what might actually be the start of your visit to Baltimore – the Visitors Center. Located at the Inner Harbor on Light Street (1-877-BALTIMORE), it's open every day to provide visitors with information about current happenings and services like ticket purchases. Having and using the GPS in my car has made a big difference for me. Now I can get most anywhere by just programming in the address. It simplifies traveling so much, and takes a lot of the stress out of getting around. 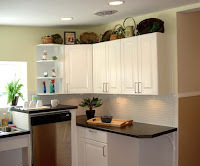 What I want to do now is make it that easy for buyers to see the possibilities in the homes they are looking at, especially when they already have ideas about what kind of location they "need." Buyers usually ask the "where is it?" questions, often with, "is it close to _____?" or "my kids need to go to __________," or "my husband works at _________." It pays to ask questions about specific "I need to live close to _______" statements and then listen carefully. Sometimes you can help them see another solution that expands their options. For instance, when a buyer says they want to live nearer the airport, you might find the answer is "we have a lot of family visits and out-of-town business visitors, and spend a lot of time picking them up." The days when you could meet someone at the gate are long gone, so how about finding another way to pick up the visitors? In Maryland, there are several ways to get to and from the BWI airport besides using your car – bus, Amtrak, the Light Rail, and Marc trains. Ahh – so now you can expand the area where your clients can live as long as the house is near transportation that connects to the airport. In other words, have the transportation "source" near the house, not the transportation. Also, listen carefully when your buyer talks about commuting distance or needing to be close to schools, hospitals, and recreation. 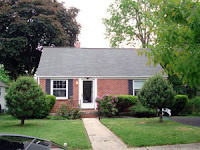 I recently took a listing in Havre de Grace which is several miles northeast of Baltimore. 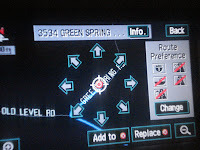 Yes, I drove there – my GPS took care of it! According to the owner, it is only 12 minutes from the Marc train that serves downtown Baltimore and Washington, D.C. with many trains every day. That makes it convenient whether for commuting to work or heading down to see the Orioles or the Ravens play. It's only 25 minutes to Towson which is the county seat for Baltimore County. 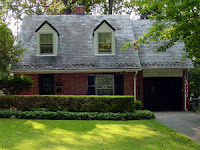 Even better, it is just minutes to Susquehanna State Park, two golf courses, a major shopping mall, and more. For what you would pay for a small town house in D.C., you can have this country mini-estate on almost four acres of rolling hills and wonderful views. Wouldn't it be nice to have this to come home to after a day in the city? There's even a small airport nearby, and people who fly small planes would love this. Turning it around and working out from my home base in 21208, I could consider opening my market up to include D.C. using the transportation corridor from here to there. Here I'm close to the Light Rail which connects to Amtrak and Marc, which connect to BWI and the DC Metro system. All I'm saying is, you can live in the counties surrounding Baltimore in a bigger home, on more land, for less money, and still keep your current job. Choose your lifestyle by how you want to live, and don't overlook alternatives by tying yourself to "I have to's" that may not be true. It's not how far you have to go, it's how long it takes to get there! It's no secret that the aging of Boomers will mean changing housing needs. This massive generation will include people who need accessible features in their homes, but won't want to give up convenience, style, and livability. Safety is always an issue, but no one wants to feel as if they are living in an institutional environment. In Baltimore, one company has taken on the challenge. 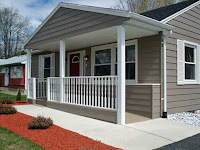 Accessible Housing Services bought a typical, small ranch house in the Pikesville area, and made changes that open the home up with options for the mobility-impaired and wheelchair users. I had a chance to see the home a while ago, and came away impressed. The front entrance is remarkable because it looks completely "normal" – the nicely fenced porch has the kind of walkway to the front door you would expect. Then you notice that the end of the porch next to the driveway is open, and it is actually the beginning of a gently inclined ramp. 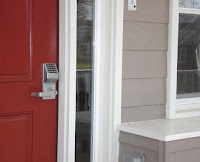 At the front door, a push-button lock and handle simplify opening. Inside are halls that are comfortably wide, and even fiberglass-reinforced walls that resist dings and dents from wheelchair bumps. The kitchen features multi-height counters to serve both standing and seated chefs. And out back, the fenced deck features the same level driveway access and French doors. Eric Anderson received the Accessibility Award from the Baltimore County Commission on Disabilities, and an Executive Citation from the County Executive for his creation of this house. It illustrates what can be done to help people stay in their homes as their health needs change. Isn't that what most of us want? How Do You Find the Perfect Home in a Buyer’s Market? Yes, I am told it is a buyer's market. There is way too much inventory on the market, and too many houses that are not selling. But still, I have good, qualified buyers who need a special home. So now we are up to six bedrooms. We need to find the right home in the right school system, and you guessed it, those needs don’t always match up. There’s another challenge, too. With a price range of $500,000 to $750,000, you’d say we have a generous budget, but we have a lot of specs to satisfy. We need a kid friendly neighborhood with sidewalks and places to ride bikes. 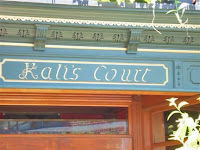 We need a neighborhood with charm and character, and houses with style - no clone-onials, no tract houses. 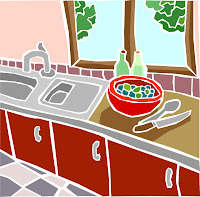 The kitchen has to be big and warm and friendly, and a place for meals, homework, and gatherings - in other words the hub of the house. There needs to be room to "get away" with kids’ space and adult space. That’s not all! 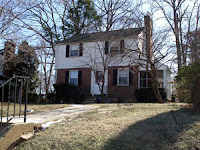 It has to be in the northern part of Baltimore County or in northwest Baltimore City in an area like Mount Washington. Easy access to the Baltimore Beltway is a must. I will make up a batch of these flyers for the buyers to keep in their cars. When they see a home they both like, they can slip the flyer into the mailbox or front door. I instruct them to let me know which homes they are interested in so I can be prepared when the call comes in. I can do the research in advance – how much it is assessed for, how long the present owner has lived there, taxes, comps etc. Why wait for the perfect home to come on the market? Anyone can wait for a home to show up in the MLS. Be proactive! These days, some sellers may be holding back, thinking they will wait until the market gets better. Just because it’s not in the MLS, don’t assume a home isn’t for sale – especially if it seems like the perfect home for your buyers. It was pouring down rain when I got the call on Rockridge Rd. It hasn't rained in Baltimore for months, but now when we finally had a good, hard, rain…someone was driving around looking at homes! The one he called about had just gone to settlement, and he was disappointed when I told him that it was no longer on the market. It seemed to be THE perfect house, the perfect location, the perfect price – everything he wanted. An interested buyer is not someone you let wander off. But he was out there in the rain, and I was home and dry. So I asked, did he have time to view a few other properties? Yep, he had time. So I gave him directions, turn right and go to 413 Milford Mill. Turn left on Greenwood and Right on Upland to 321. Back to Milford and take a right to 902 Adana. I stayed on the phone and "drove" him to all three of my other listings within the same zip code. As he approached each property, I was able to answer all his questions such as age, condition, number of bedrooms, type of heat, room sizes, additions, upgrades etc. This remote control touring seemed to be better than sending him back home to look at the website. After all, he WAS in his car even though it was raining, and thankfully I could give directions. He seemed to really like Upland Rd. He asked for the size of the yard, so I stayed on the phone with him while he walked around the house, and I described everything to him from the parking pad to the storage shed, and he could see the large level backyard. No, I don't usually suggest that buyers walk on properties, but with my permission and with me on the phone…no problem. He was extremely appreciative. I asked if he was working with an agent, and when the answer was affirmative, I suggested that the agent call me to set up an appointment. Wonder if his agent will call? Too soon to tell. But even if not...look how much time was saved. By being flexible and adjusting to his needs and the opportunity, we both came out ahead. I'm not sure what to call this kind of showing. It's not a virtual tour. Maybe a remote tour? Driving tour? Flexi-tour? Whatever name we give it, I think of it as a Type E showing – effective, efficient, and a time saver. Plus, I didn't have to go out in a downpour!